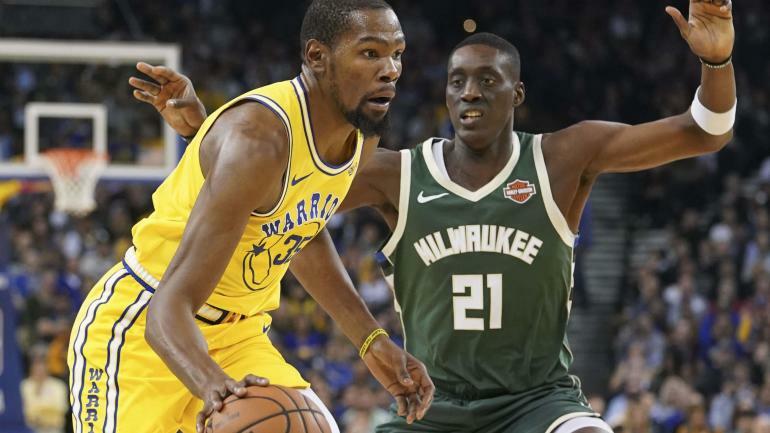 OAKLAND, Calif. — If you were still questioning whether or not the Bucks are for real, you got your answer in Thursday night’s 134-111 throttling of the two-time defending champion Golden State Warriors. Not only did Giannis Antetokounmpo look every bit of the MVP candidate that he is, but Milwaukee’s supporting cast also stepped up on both ends of the court to dismantle the Warriors at Oracle — no simple feat. Giannis finished with 24 points, nine rebounds and four assists, while the balanced Bucks lineup was led by Eric Bledsoe’s 26 points, Malcolm Brogdon’s 20, Khris Middledon’s 17 and Pat Connaughton’s 15. The Warriors struggled with foul trouble and a lack of energy from the jump, and the Bucks took advantage, getting hustle points and making effort plays all night long. The loss ends an eight-game winning streak for the Warriors, and brings the Bucks to 9-2 on the season. Here are some takeaways from the game. Warriors coach Steve Kerr said before the game that without Draymond Green in the lineup (he was ruled out with an injured foot), it was more a matter of effort than game plan on the defensive end. Well, Golden State certainly didn’t put up much of an effort. They were sloppy and committed too many fouls early, as Giannis Antetokounmpo got to the free throw line 10 times in the first half alone (making nine of them). There were plenty of times when the Warriors went on a mini-run and needed a couple of defensive stops to further close the gap. Without Draymond, they were unable to get it done. Stephen Curry came into the game shooting 53 percent from the field and 51 percent from behind the 3-point line, so a regression was probably due. Curry missed some open shots, but was also bothered all night by Milwaukee’s length, finishing the night with 10 points on 5-of-14 shooting, including 0-for-4 from 3-point range. Chalk it up to a bad night from the two-time MVP, but the Bucks’ defense definitely had a lot to do with it. On the other side of the ball, Curry picked up two quick fouls and struggled containing explosive point guard Eric Bledsoe, who had pretty much a free pass through the lane and to the rim all night long. Most concerning for the Warriors, however, is that Curry went to the locker room in the third quarter with a left adductor strain, and did not return to the game. After several healthy seasons, Curry suffered multiple ankle injuries last year and only played in 51 games. The Bucks appear to be here to stay. This was a huge win, and it showed that they can win choppy, grind-it-out games just as handily as they win fast-paced 3-point shootouts. Before the game, Kerr talked about how successful Budenholzer was with the Hawks, but pointed to one key difference — now he has a superstar. That Hawks squad topped out at 60 wins, and we’ll have to wait and see if this Bucks team can come close to that mark.